This tiny creature has gotten a fair bit of attention lately because of one simple reason: It’s absolutely crazy-looking. At first glance, it resembles a Pokémon or character from Final Fantasy more closely than a real biological animal. 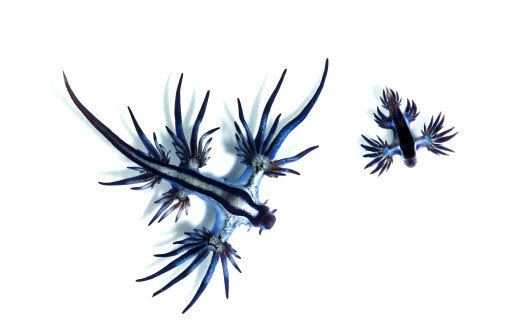 But the Glaucus atlanticus sea slug—commonly known as the blue sea slug or blue dragon—is indeed a genuine species. And if you swim in the right places off of South Africa, Mozambique or Australia, you just might find one floating upside down, riding the surface tension of the water’s surface. The species has a number of specialized adaptations that allow it to engage in a surprisingly aggressive behavior: preying on creatures much bigger than itself. 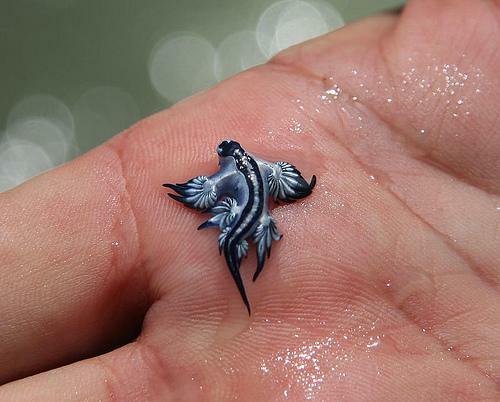 The blue dragon, typically just an inch long, frequently feeds on Portuguese man o’ wars, which have tentacles that average 30 feet. A gas-filled sac in the stomach allows the small slug to float, and a muscular foot structure is used to cling to the surface. Then, if it floats by a man o’ war or other cnidarian, the blue dragon locks onto the larger creature’s tentacles and consumes the toxic nematocyst cells that the man o’ war uses to immobilize fish. The slug is immune to the toxins and collects them in special sacs within the cerata—the finger-like branches at the end of its appendages—to deploy later on. Because the man o’ war’s venom is concentrated in the tiny fingers, blue dragons can actually have more powerful stings than the much larger creatures from which they took the poisons. So, if you float by a blue dragon sometime soon: look, but don’t touch.